AFLW Draftees' Dreams Come True Susan Alberti Award winner Jamiee Lambert has been taken with the Dogs' first pick overall, as the Club adds 19-players to its list for 2017 in the historic AFLW Draft. 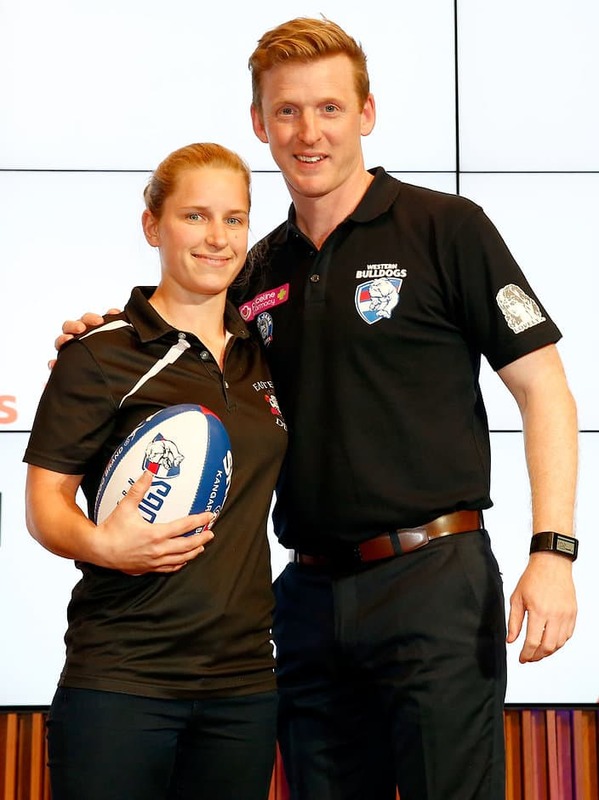 Jaimee Lambert won the Susan Alberti award last Wednesday night for her performance across this year’s AFL Women’s Exhibition Series for the Western Bulldogs, and was today taken with the Club’s first pick in the 2016 NAB AFL Women’s draft. In another historic day for women’s football, Lambert was amongst 19 players added to the Western Bulldogs’ playing list for the inaugural AFW season. Taken at pick five overall, Lambert’s selection was followed by Darebin Falcon Aasta O’Connor at pick 12 and Hannah Scott of the Eastern Devils at pick 21. Both O’Connor and Scott had previously represented the Club through the AFL Women’s Exhibition Series. A tough-as-nails midfielder who dominates at the coal-face, Lambert said it was a dream come true to be drafted to VU Whitten Oval. “I couldn’t be happier than to be at the Bulldogs,” she said. Western Bulldogs Women’s coach Paul Groves said that it wasn’t just the 22-year-old’s toughness that saw her stand out from the pack. “In the all-star game she had nine or ten tackles, but she’s got tricks, she can take a hanger and loves to kick a goal as well, so, I think we’ve drafted the complete package," he said. O’Connor, speaking with westernbulldogs.com.au said she was grateful to be ‘home’ at the Bulldogs after playing previously in the red, white and blue, but looking beyond her own selection, she said it was a day of celebration for women’s football. “It really is a day of celebration for female football, and where the game is, and where it can go," O’ Connor said. “It’s really about what we can create as players [but] the hard work begins when you get to the Club and you put your head down and start working, so I’m really looking forward to that. The Club’s newest draftees join marquee signings Katie Brennan and Ellie Blackburn, and rookies Libby Birch and Romy Timmins. The National Women’s League will commence in February, 2017.